It’s the new year and I am super excited to be diving into a healthier lifestyle this year. I started off the year eating a healthier diet and making big changes in my lifestyle. I know people always make New Year’s resolutions and some stick to them and some don’t. I am sticking to it and making my life that much better and richer. I bet when you think of pancakes, you think glutinous and so good, but so bad for you. 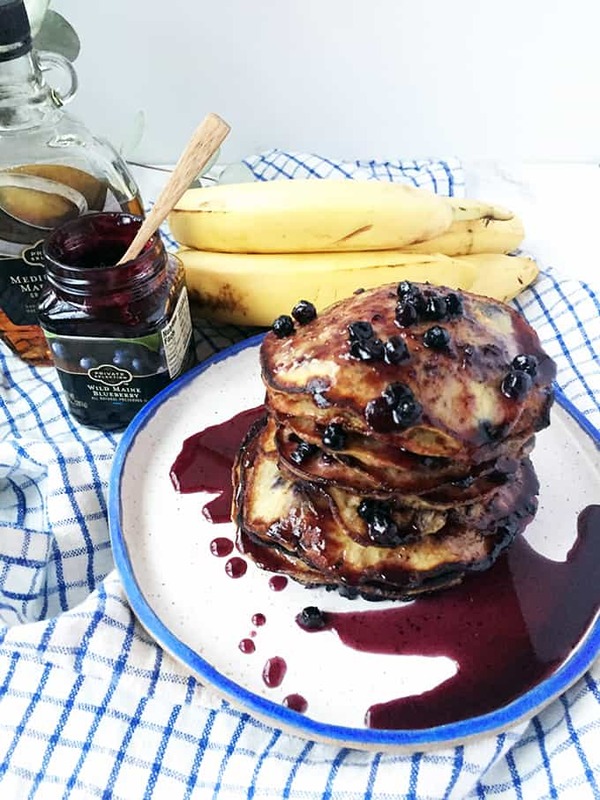 Well I wanted to share this delicious and healthy recipe with you for my favorite Gluten Free Wild Blueberry-Banana Pancakes that I have been making for my family. I have been working with Kroger and developing recipes for them for a few months now. It’s a great way for me to come up with fun ideas and recipes using ingredients I purchase at my local Fred Meyers. 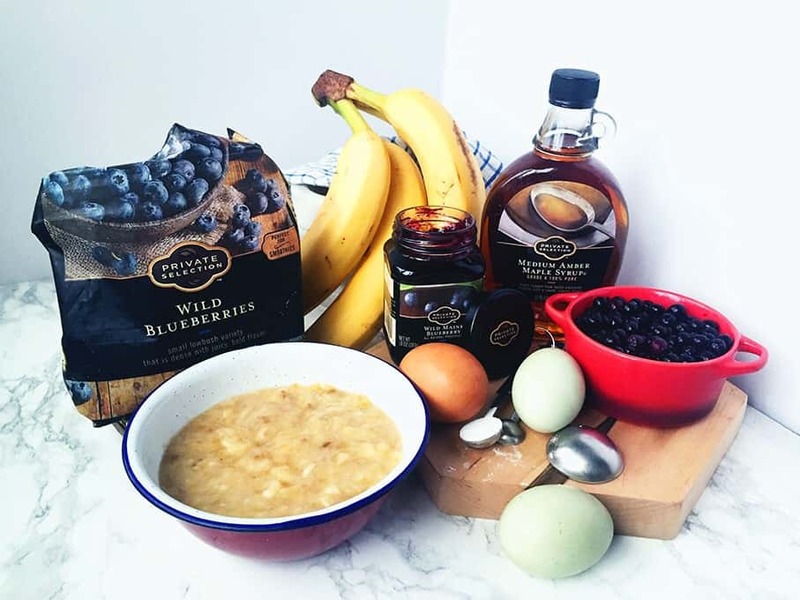 This time I was asked to use some of their Private Selection products, including blueberries for pancakes. So, I found these lovely little Wild Blueberries in the frozen isle to make my pancakes. Also found a Wild Blueberry jam to update the flavor of Private Selection Maple Syrup. 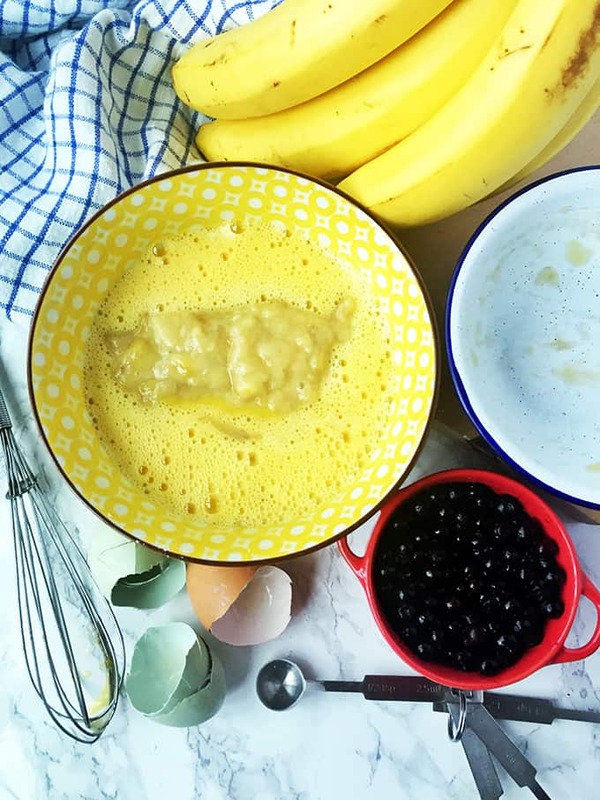 These pancakes are a great weekday or a weekend treat for you or your family. My kids love enjoying these and it;s something you can include your kids in creating too. Whenever I get a chance to involve my kids in making food with me I go for it. They helped with the smashing of bananas and whipping the eggs into the mixture. My secret to making these pancakes fluffier is by adding baking powder to them. A little bit goes a long way to making these fluffy and adds the height that you can’t get without flour. Lets get cooking. Start by using either your fingers or a fork and smash the ripe bananas into a bowl. 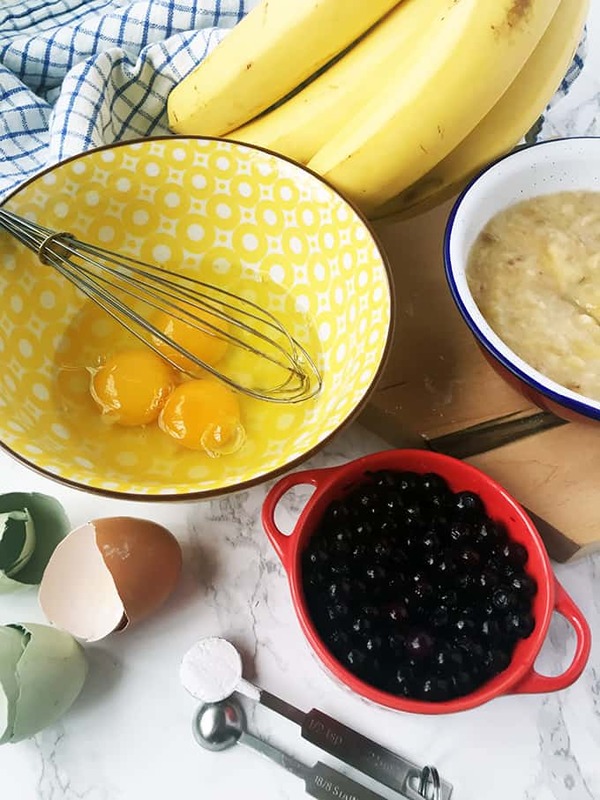 In a separate bowl whisk together the 3 whole eggs and then add them into the bananas. Whisk together. Add the 1/4 tsp of baking powder and mix well. Let the mixture stand for about 15-30 minutes for the flavors to set. Heat a non stick or cast iron skillet with a tablespoon of coconut oil. 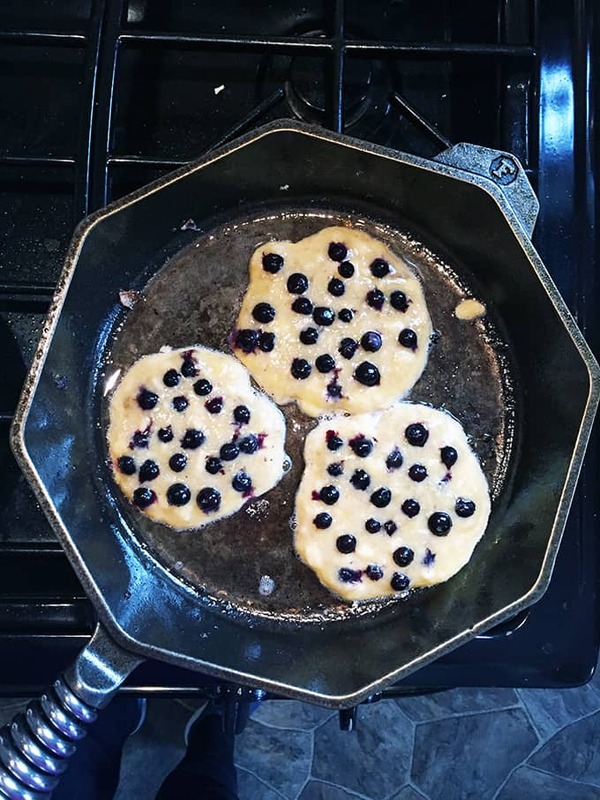 Add 1/4 cup of the batter, as little or as much of the wild blueberries that you like, I like more so I covered a good area of each pancake. When bubbles begin to form, lift pancake, wait until golden brown, flip over. Cook until golden brown on both sides. Serve immediately. 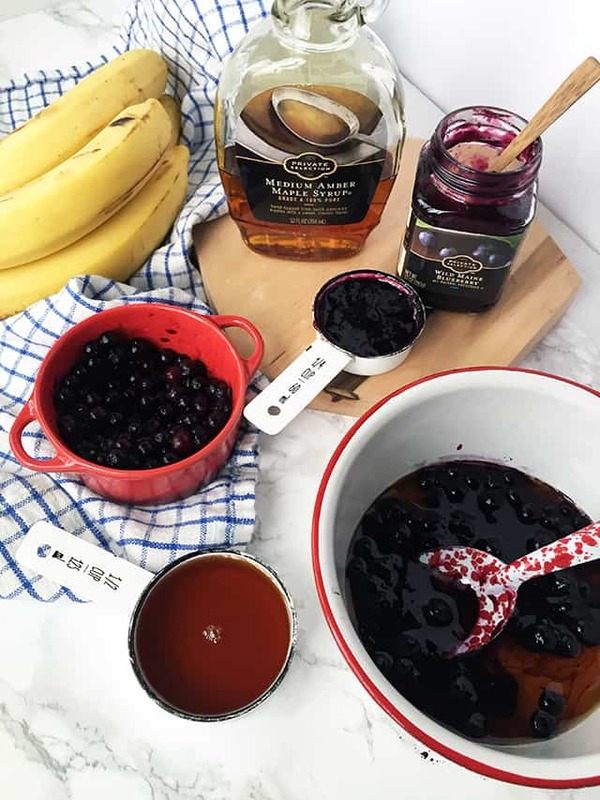 Place frozen blueberries, maple syrup and preserves in a medium saucepan. Place pan over medium heat. Stew the blueberries until tender and falling apart, 15-20 minutes while the pancakes are being cooked. Remove from heat. 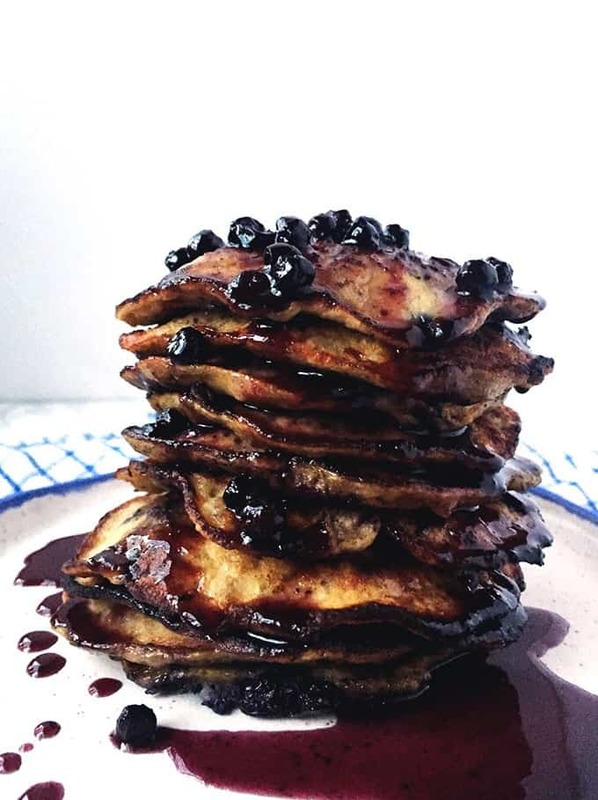 Add this delicious syrup to the stack of pancakes and enjoy these without the guilt. Store leftover blueberry syrup in an airtight container in the refrigerator for 1 week. Just made these and was surprised how good they turned out. Ever since I saw this on your snapchat story I knew I had to try them. Thanks for sharing. So glad you liked the recipe. They are my new favorite go to to make on the weekends.